His Holiness the 14th Dalai Lama shared worldly wisdom from his lifelong experiences with 27 youth leaders from 12 different conflict zones, on how to move forward and live peacefully as one human race. 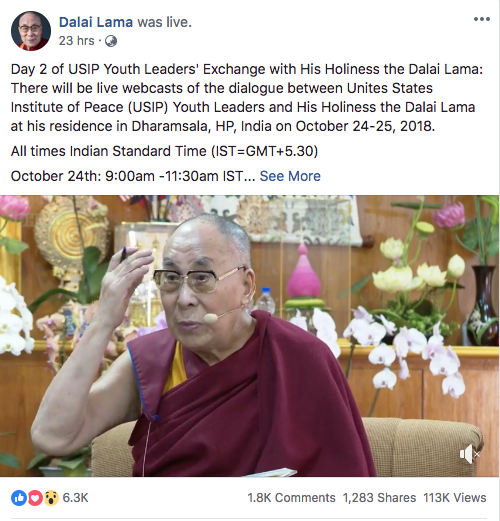 Likewise, netizens across the globe were glued onto live webcast of the event showing via @DalaiLama, the official Facebook page of His Holiness the Dalai Lama. His Holiness reiterated on the oneness of 7 billion human beings and stressed on coming together as brothers and sisters whenever there is a problem either caused by man-made or natural borne on this planet earth. He emphasized the inclusiveness of emotional hygiene in our secular education system. Moreover, he said our innate compassionate nature should be keeping pace with our intelligent mind for a peaceful and happier 21st century. During the questions and answers round, a delegate from Venezuela asked whether it is possible to achieve peace when you have no freedom. To his reply, His Holiness explained on his own experience of conflict from Independent country to the Chinese invasion and to flee into exile. He said it was a correct decision to escape into exile where he was able to preserve Tibetan culture and rebuild homes and provide education for Tibetan children. In addition, he said resorting to violence is only self-destructive but whereas non-violence approach is more effective in the long run. Speaking on a realistic approach, he mentioned there are about 400 million Buddhists in China; many of them appreciate the value of Tibetan Buddhism. He said Chinese could bring material development in Tibet, Tibetans, on their part, could offer China spiritual development. That way, both sides could live in harmony and peace of mind. When asked about the role of women, he reiterated advice he often gives about the need to see more women in leadership roles and more closely involved in education about compassion. His Holiness parting advice for the youth leaders is we can change the world when we have firm believes and tackle the problems together. 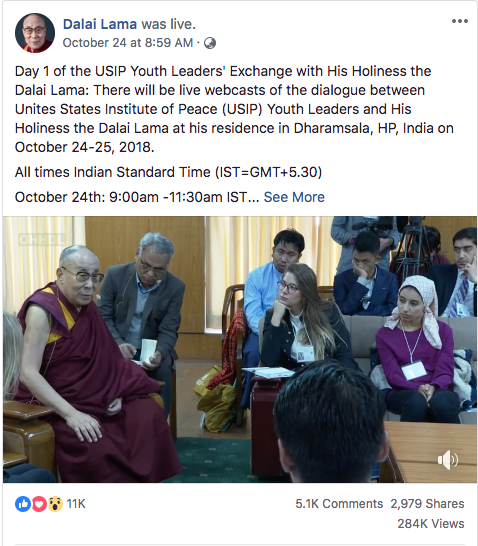 Such kind of meeting with the youth from United States Institute of Peace is the third time in a row at his official residence in Mcleod Ganj.